Prevent turf burns with lightweight sleeve constructed of Tubular Compression Bandage. They feature a sewn in, breathable foam pad for added protection without restricting range of motion making them popular with skill position athletes. Scuffpads are available with or without the foam padding and comes in the standard 12" length or an 8" "shortie" length. Machine washable. Most sizes available in White or black. By the pair or dozen pair. 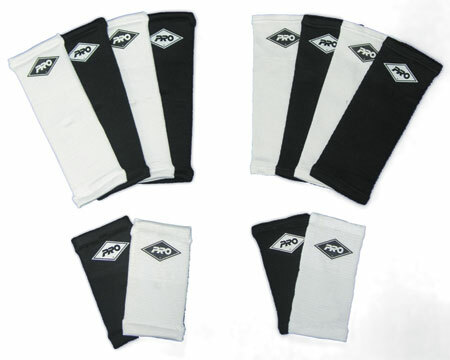 PRO Orthopedic’s No Foam Scuff pads are available in 2, 3, 3½, 4, 5, 6, 7 or 8 inch width, custom cut and hemmed to length. Custom Scuff Pads up to 30” long can be fabricated for as little as $12.95 per pair; to place your custom order please call 1-800-523-5611.